Today with the help of Egon the SMSD was successfully integrated with the CDK. The nightly build is available via nightly build. If you are interested in the source code then please visit GIT SMSD. Q: How can I compute Substructure search between a query and target molecule? Q: How can I compute MCS search between a query and target molecule? Here is a brief FAQ for the SMSD users. 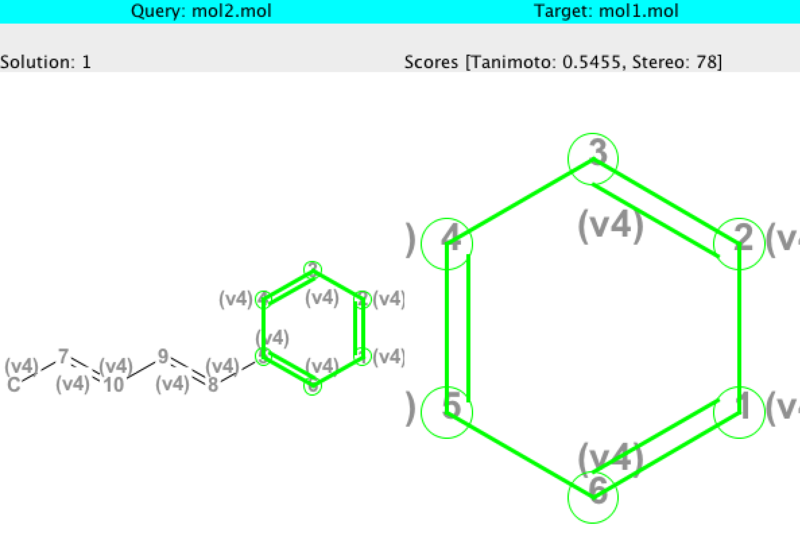 Q: How can I use SMSD to perform Maximum Common Subgraph/Substructure (MCS) search between two molecules? Q: Can I perform faster substructure search using the SMSD ? A: The SMSD supports ultra fast substructure search mode which do not require exhaustive MCS search. This mode uses a specialised substructure search algorithm coded in the SMSD. Q: What are chemical filter(s) in the SMSD and what do tthey mean? The concept of chemical filters was designed to rank the MCS solutions in a chemically relevant manner. Each MCS search usually reports more than one possible solution and it would be useful if the best match was the top hit. For example, if a query molecule has an open ring and a closed ring fused together while the target has a closed ring (benzene). The reported solution a) closed rings are matched b) open ring matches with closed ring. As a user one would expect two closed ring matches to precede the later match. This can be achieved by using the stereo filter. Likewise, fragment filters are useful if you want your matched components to occur in the periphery. Q: Can I perform bond sensitive searches and bond insensitive searches (single bond can match with double bond) ? A: Yes SMSD supports both types of searches. Bond insensitive searches are preferred if you are looking to match overall scafold between two molecules. Bond sensitive searches are more stringent and they report core matches between two molecules. Note: Bond insensitive searches are computationally more exhaustive and demanding than bond sensitive searches.